By 1900, Chinatown - bustling as ever - was jammed with dilapidated and flimsy wooden structures, plagued by poor sanitation, periodic flooding, dense living conditions and rat infestations. Such conditions practically invited an outbreak of bubonic plague. December 12, 1899 You Chong, a bookkeeper for Wing Wo Tai's business on Nu`uanau Avenue, died of the plague. By the end of December, nine more cases of plague were reported. The Board of Health established a quarantine station in Kaka`ako with military guards enforcing victims' isolation. To clear contaminated areas, the Board set 41 controlled fires, cleaned and disinfected buildings, burned garbage, filled old cesspools and dug new ones. On January 20, 1900, another planned fire cleansing was begun at Beretania between Nu`uanu and the old Kaumakapili Church. This time wind gusts spread the fire to the church and from there flames leapfrogged all the way to the wharf. The huge fire burned 17 days, destroying 38 acres and 4,000 homes (mostly Chinese and Japanese). After the disaster was brought under control, the Board of Health successfully set an additional 31 controlled fires. Four months later, Honolulu was deemed plague-free. 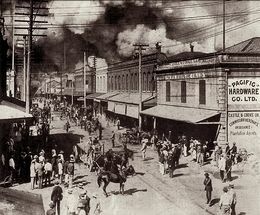 The 1900 fire had a major impact on Chinatown's demographics. Many Chinese residents, made homeless by the fire, left and settled elsewhere. Most businesses continued to be owned by Chinese, but many business owners did not return to Chinatown as residents.